The moral of last night's story is that the changes she made to my seat are internalized enough that we can move on to our next positional victim: my backward-thinking hands. First, she had me ask for changes of bend using just my seat and legs. "The bend comes from the seat and legs, the hands are just there to accent those aids." She had me think about posting with my inside hip bone toward my outside wrist for inside bend, and vice versa for counterbend. I ran into some trouble in the beginning because I also weighted the seatbone more, which is the opposite of what I wanted to do - for inside bend, I needed to "sit right to go left" (thanks, Nancy K!) AND direct the inside seatbone/hip toward my outside wrist. I do solemnly swear that I will be pulling his mane before FRV, amen. Next, she had us stop and stood in front of us, holding the reins a few inches above Connor's bit. She used her arms to simulate his head and had me follow with my arms in my usual way first, and then next while thinking "forward" with each step. She then had me go back to my normal way, and I could clearly see then that while I am not pulling backward, I still have a lot more rein pressure than I need, and I am not encouraging his energy to go either forward or up. That one change produced some dramatic results, especially at the trot. She had me keep my reins so much shorter than I normally do, and think 'up' with each stride while keeping my hands close to the crest of his neck. It felt like my hands were softly sliding forward with each step, almost, lots more movement than I am used to. Suddenly, not only was the energy generated from his hindquarters and my newfound seat going forward, it was manifesting itself in a light front end with an elevated poll as well. So cool! 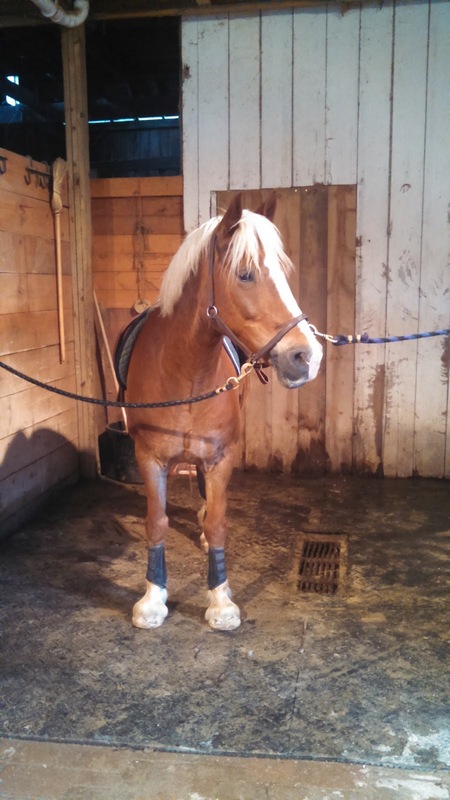 He managed to hold the best trot we've ever gotten for maybe 10 minutes before we could feel that he needed a break. The rest of the lesson was good, amazing by 6 months ago's standards, but paled in comparison to those 10 minutes. Now to work on making that new stuff consistent - and to get that at the show! Also: shoulder-in, especially to the right, which has always been his bad direction, even when we couldn't turn left. "His middle name needs to be shoulder-in right now." The biggest thing that helps with it is remembering to keep my inside shoulder back. Homework - got it. - Second tail shampoo and leaving for Fox River Valley on Thursday! I constantly have to remind myself to keep shorter reins with lighter hands. So hard!! I have a hard time keeping my reins short too, and my contact consistent. I think it's from growing up riding so many hunters. I love your lesson write ups. :-) Glad you guys are progressing. Best of luck at the show! Spa days... Miles needs one of those this weekend! I'm constantly working on the same thing at home, and then I get to shows and my hands are perfectly happy to sit primly in my lap. Guilty as well of letting my reins be too long. Sounds like you and Connor are making wonderful progress! Woohoo! So exciting that the shows around the corner.